Joy is a retired journalist who worked on newspapers and magazines in New Zealand and Australia. 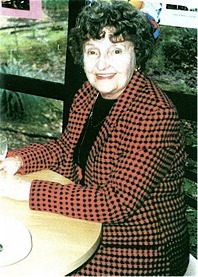 She retired as Assistant Editor of the "NZ Women’s Weekly" magazine in the 1970’s. A great-granddaughter of James and Catherine (nee Clague) Qualtrough, who emigrated from the Isle of Man to New Zealand in 1859, Joy descends down the Thomas and Polly (nee Prince) Qualtrough line. See Chart 7 of A QUOTA OF QUALTROUGHS. She is co-author with Elizabeth Barlow (Feisst) on the family history, A QUOTA OF QUALTROUGHS, which won the Isle of Man Family History Society’s Literature Award in 1984, and the NZ Society of Genealogists booklet, HOW TO PLAN A FAMILY REUNION. Joy was on the Organising Committee, along with several other Qualtrough descendants, which arranged the 1979 Qualtrough Family Reunion held in Pakuranga, Auckland, New Zealand in October, 1979. This event, attracting over 350 descendants, was organized to coincide with the 120th anniversary of the immigrant family, James and Catherine mentioned above, and also with the Manx Millenium Celebrations, celebrating 1000 years of continuous government in the Isle of Man. Joy is retired and lives in Auckland, New Zealand. She is active in the community being President of the Mt Roskill (Auckland) Probus Club and also works in a local Opportunity Shop and delivers Meals on Wheels. Her husband, Hill McDougall, died several years ago.